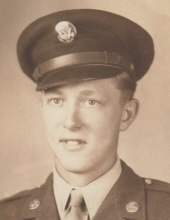 Earl W. Bark, age 92 of Clarence, passed away on Wednesday March 20, 2019 at the Clarence Nursing Home. Visitation will be held on Saturday March 23 from 9:00-10:30 A.M at Chapman Funeral Home in Clarence. A private family burial will be held at the Clarence Cemetery with Reverend Matt Schneider-Adams officiating. Earl was born on May 23, 1926 to William and Marie (Griem) Bark in Clarence, Iowa. He married Phyllis Krafock on April 6, 1953 at St. John’s United Church of Christ. She passed away on September 1, 2010. Earl served his country in the Army Calvary during World War II. He later farmed and worked as a carpenter at the Clarence Lumberyard. Earl played baseball from his high school years into the Corn Belt League, and also played softball into his 50’s. He helped his son-in-law, Dan, build his house when he was in his 80’s. At the age of 92, Earl shot his age in golf (46). He is survived by his daughters, Sandy (Todd) Boyer of Bettendorf, Cathy (Dan) Johnson of Mt. Union, and Susan (Bob) Wallet of Casa Grande, AZ; grandchildren, Traci Johnston (Ian) , Leslie Wilson (Nic), Alex Wallet (Amanda), and Natayla Wallet; great grandchildren, Parker, Harper, Rylee, Liam, Lane, Oliver, and Andan; and brothers, Frederick (Jean) of Solon and Donald (Jo) of Marion. To plant a tree in memory of Earl W. Bark, please visit our Tribute Store. "Email Address" would like to share the life celebration of Earl W. Bark. Click on the "link" to go to share a favorite memory or leave a condolence message for the family.